The chapter is famous for its declaration regarding the Night of Power (Laylat al-Qadr), during which the Quran was first revealed. This is universally believed to have occurred during the month of Ramadan, as stated in Quran 2:185. Muslims maintain that the Night of Power comes every year. Many reports say that the Night of Power occurs during the last ten nights of Ramadan. Most scholars maintain that it occurs on one of the odd-numbered of these last ten nights. This chapter speaks about the promised great night which the whole universe marks with joy and prayer. It is the night of perfect communion between this world and the Supreme society. That night marked the beginning of the revelation of the Quran to Muhammad, may the mercy and blessings of God be upon him, an event unparalleled in the history of mankind for its splendor and the significance it has for the life of mankind as a whole. Its greatness is far beyond human perception. The Quranic statements which relate this great event radiate with God’s clear and shining light. There is also the light of the angels and the Spirit (Angel Gabriel) moving between the earth and God, Most High. In addition, there is also the light of dawn which the chapter represents as perfectly harmonious with the light of the Quran and the angels as well as with their spirit of peace. 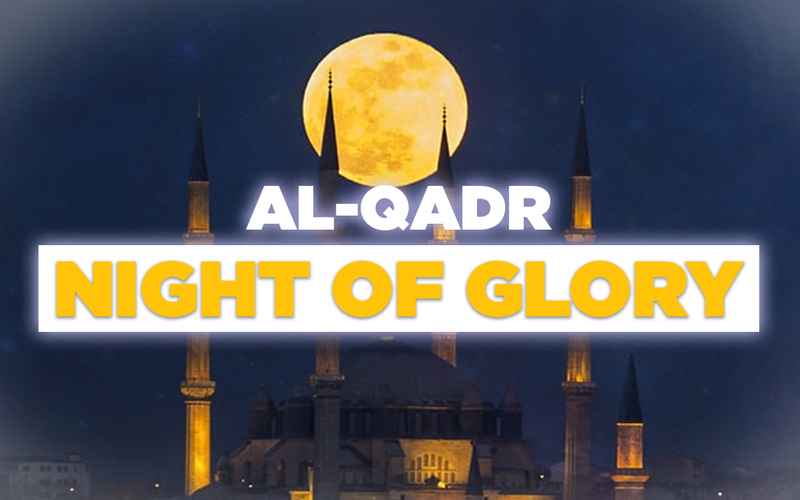 The night in question here is the same night referred to in Quran 44:3-6. Its name, Laylat al-Qadr, or the Night of Power, may be taken to mean deliberate planning, management and organization, or it may mean value, position and rank. Both meanings are relevant to the great, universal event of the revelation of the Quran and the assigning of the message to the Prophet. It is indeed the greatest and most significant event the universe has ever witnessed. It is the event which explains most clearly how human life benefits by God’s planning, management and organization. This night is better than a thousand months. This night is too sublime for proper human perception. It is great because God chose it for the revelation of the Quran, so that its light may spread throughout the universe, and divine peace may spread in human life and conscience. The Quran includes an ideology, a basis for values and standards, and a comprehensive code of moral and social behavior, all of which promote peace within the human soul and in the world at large. It is great because of the descent of the angels, and Gabriel in particular, by God’s leave, carrying the Quran. They fill all the space between heaven and earth in such a splendid, universal celebration, vividly portrayed in this chapter. Islam is not mere formalities. Hence, the Prophet specifies that the consecration of that night must be motivated by faith and devotion. This would make its consecration by any individual an indication of his or her full awareness of the far-reaching effects of what took place on that night. The Islamic method of education and character building links worship with faith and establishes truth in our hearts and consciences. By this method, worship is considered a means for maintaining full awareness of this truth, its clarification and firm establishment in our minds, hearts and souls. This method has been proved to be the best for the revival of this truth so that it has an unfailing influence on our behavior.